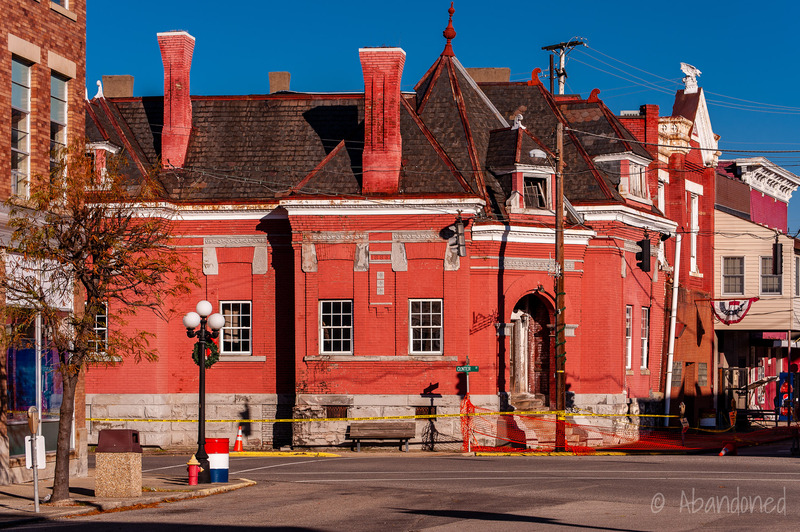 The Catlettsburg National Bank Building is a now demolished historic bank building in downtown Catlettsburg, Kentucky. In January 2012, the city of Catlettsburg filed a complaint against the building’s owners. 1 The city claimed that the interior roof of the building had sunk seven feet, that there were trees growing within the structure and that part of the facade had collapsed onto 26th Street. 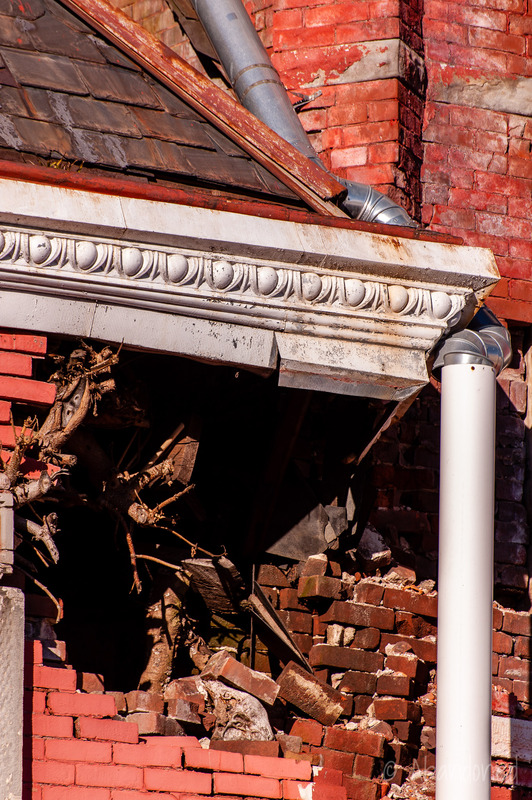 On January 20, Judge George W. Davis III issued an order for the building razed. 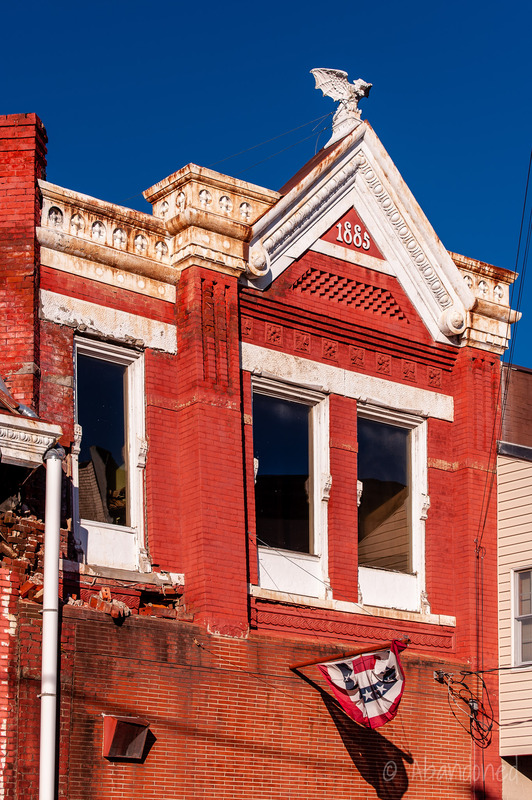 A two-week grace period, granted by city officials from the city, allowed Catlettsburg Main Street and the Kentucky Trust for Historic Preservation access into the bank building for a feasibility study on rehabilitation. 1 Upon a closer look, it was discovered that the ceiling, which the city alleged had sunk seven feet, was a false ceiling. 2 It was attached to the original ceiling above, which was in good condition. 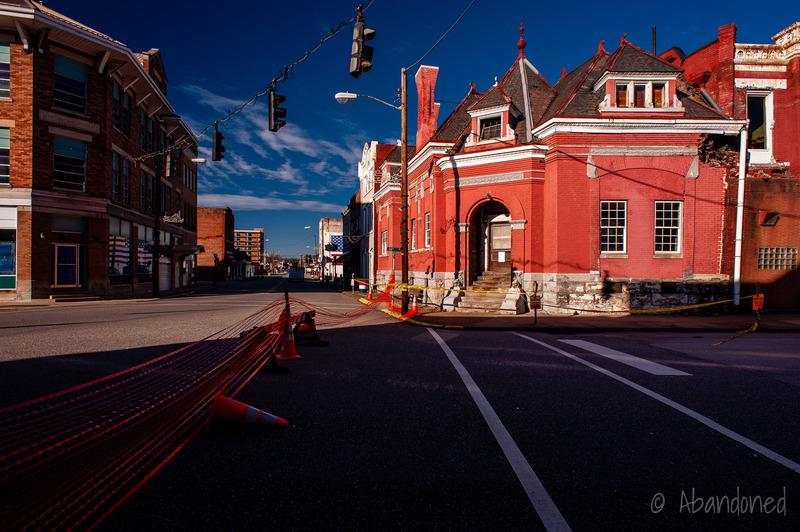 In order to hasten rehabilitation of the Catlettsburg National Bank Building, the property was acquired by the Kentucky Trust for Historic Preservation. 4 According to plans filed by the Kentucky Trust, renovations were set to begin in the summer. After renovations were completed, the building would be deeded over to Catlettsburg Main Street. But by May, no work had started due to a lack of funds. 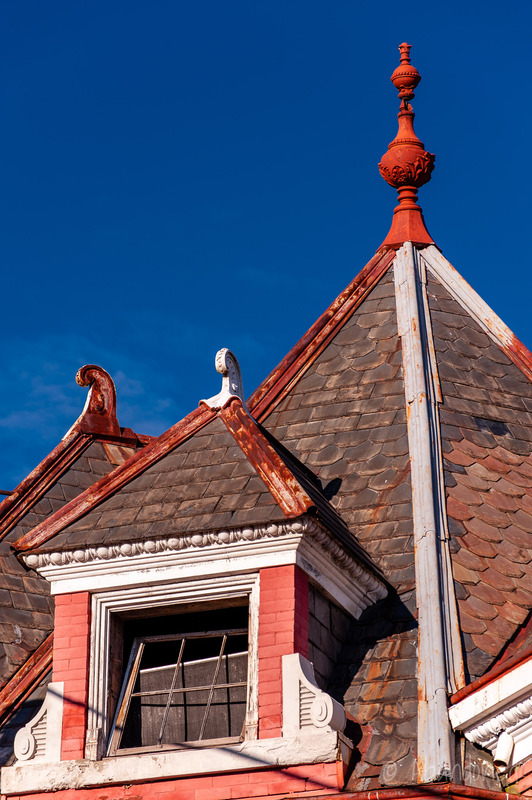 The Kentucky Trust was waiting to receive $45,000 in emergency funds from the National Trust for Historic Preservation as well as additional money from the Kentucky General Assembly. 5 Additionally, the organization was waiting for a structural engineer to examine the building and file a report. 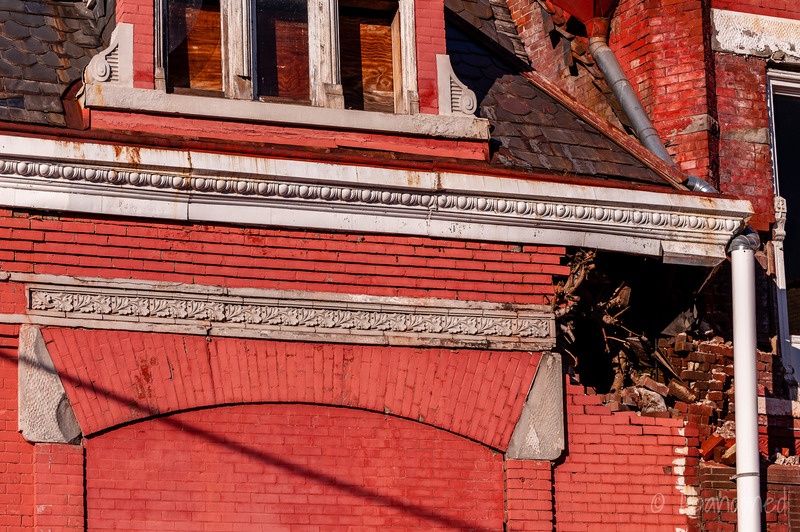 At about 8:30 a.m. on July 27, 2014, a significant portion of the façade of the bank collapsed on 26th Street. An emergency demolition of the entire building was ordered and work began that evening. Photographed in December 2011 after a neighboring building partially collapsed. Brandenburg, Katie. “Efforts beginning to save building.” Daily Independent [Ashland] 21 Jan. 2012: n. pag. Print. Brandenburg, Katie. “Official looks at National Bank building.” Daily Independent [Ashland] 31 Jan. 2012: n. pag. Print. Brandenburg, Katie. 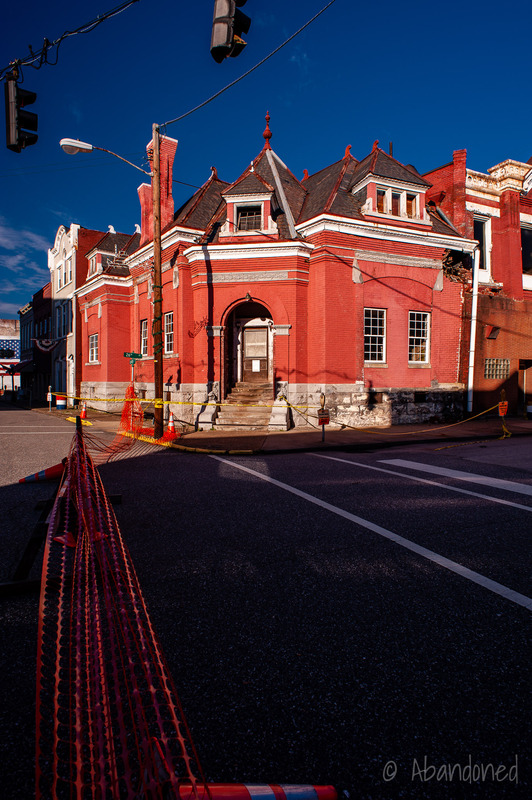 “Leaders no closer to determining fate of historic Catlettsburg bank building.” Daily Independent [Ashland] 7 Feb. 2012: n. pag. Print. Brandenburg, Katie. “Catlettsburg building set to be restored by state preservation group.” Daily Independent [Ashland] 15 Feb. 2012: n. pag. Print. Hart, Kenneth . “Gate City council gets some answers on rehabilitating historic downtown structure.” Daily Independent [Ashland] 10 May 2012: n. pag. Print. James, Mike. “Experts say bank building not bad.” Daily Independent [Ashland] 22 Aug. 2012: n. pag. Print. Stambaugh, Carrie . “Restoration process under way.” Daily Independent [Ashland] 17 Dec. 2012: n. pag. Print. United States. Dept. of the Interior. Old Bank Building. Comp. Jennifer Kaye Robinson. Washington: National Park Service, Mar. 1973. National Park Service. Web. 28 Jul. 2014. Article. Ely, William. History of the Big Sandy Valley. 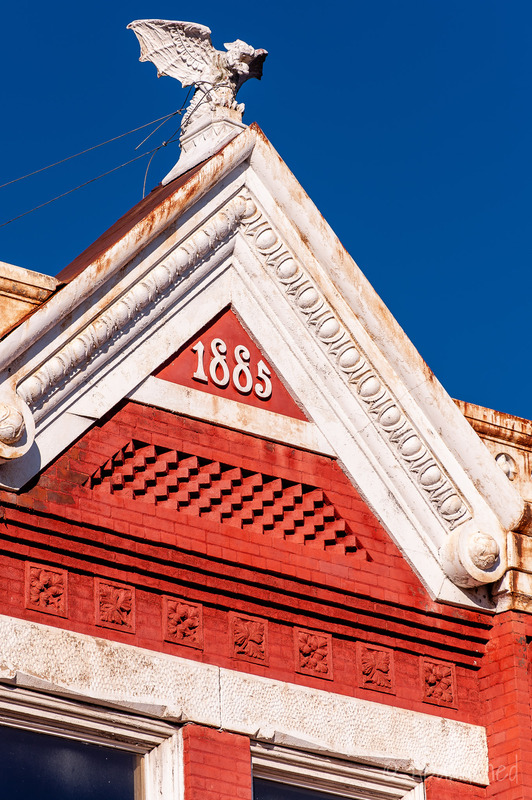 Catlettsburg, 1887: 286. Print. So many memories of the hometown I grew up in. Dr. Ray, Dr. Ashworth, Dr. Boo, Dr. Donahoe. CHS, class of 1965.